Pearls of Prophet Mohammed(P.B.U.H) : Serve Your Parents; It's exactly what Jihad is.. Serve Your Parents; It's exactly what Jihad is..
"Shall I participate in Jihad?" "Are your parents are living?" The Prophet said, 'Do Jihad for their benefit'." 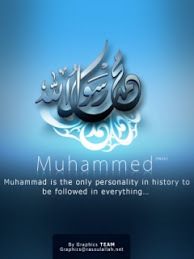 Mohammad is the only personality in history to be followed in everything..
Click Here! to get in my little world.. I said mother, where your generosity is? Didn’t your life nourish mine? Father can you give me one of your good deeds? You expect to find more good deeds? So I said, weren’t you my safe haven? And your heart was my home? Weren’t you always protecting me? Haven’t you worked so hard for me to grow? I shouted, finally I have found my way out! Can’t you see how much I am in need? Have you forgotten my love to you?